Keith Dannemiller was born in Akron, Ohio and educated there in Catholic elementary and high schools. He graduated from Vanderbilt University in Nashville, Tennessee with a B.A. in Organic Chemistry. 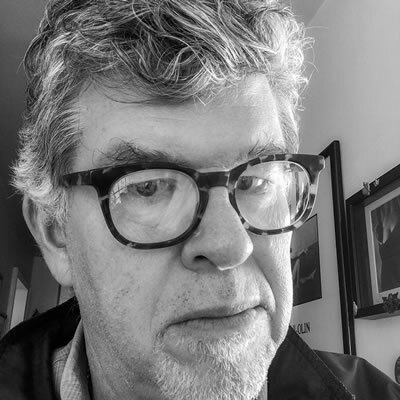 After four years in San Francisco, he moved to Austin, Texas where he worked for The Texas Observer, Third Coast, and Texas Monthly. While living there, he began the first of many photographic trips to the north of México, in the area around Espinazo, Nuevo Leon, where he documented the festival of the Niño Fidencio, a folk saint renowned in México during the 1920’s. In 1987 he decided to live and work in México. A relationship that began with the Mexican photo agency Imagenlatina in May, 1987, resulted in two trips to the Middle East (1988 and 1989) to cover the Palestinian Intifada. While currently independent, during the past 31 years he was associated at different times with two US photo agencies: Black Star and Saba. In Latin America, he has covered a wide variety of situations, ranging from Nicaraguan Recontras to street children in México City to life on the US-México border. A recurring theme in his personal work is the effect on the country’s rich traditions while Mexican society constantly reshapes itself. Visual projects that have captured his interest include: a fundamentalist sect that uses exorcism to deal with social problems; portraits from the streets of Mexico City’s Centro Historico; Danzón in public parks; the modern syncretic rituals associated with the growing cult to the Catholic saint, Jude Thaddeus; the struggles of Central American migrants in Mexico enroute to the United States; and currently, the effects of drug violence on the internally displaced persons of the southern Mexican state of Guerrero. 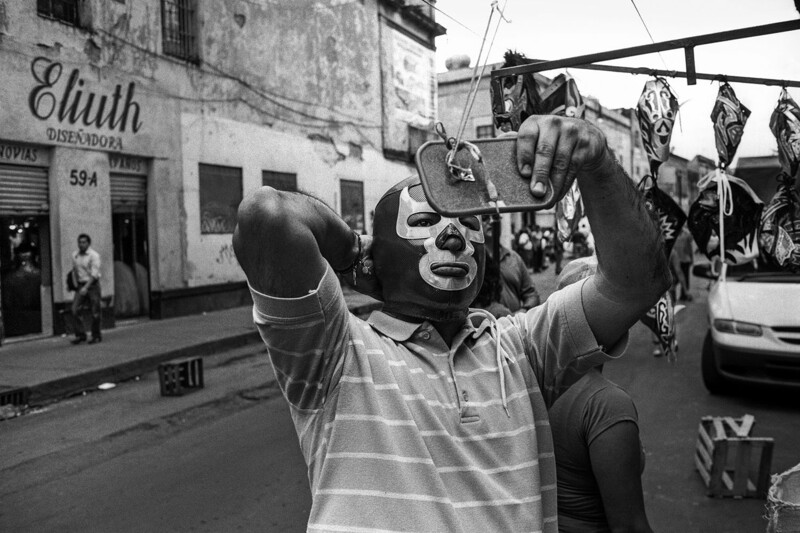 His most recent book, Callegrafía, is a look at the intimate strangers who move through the streets of the Centro Histórico of Mexico City each day. He lives with his wife in the Colonia Nápoles of Mexico City. Group Show: “Ey Familia: Danzón!”. Gallery Fundación Héctor Garcia, México, DF, October 2010. Group Show: “Desplazamiento Interno Forzado. Una Dolorosa Realidad”. Museo Memoria y Tolerancia, México 2015, Mayo 2015. Group multimedia presentation. “Calle Nuestra”. A photographic panorama from various cities in Latin America: Mexico City, Pachuca (Mexico); Caracas (Venezuela); Guayaquil, Quito (Ecuador); Sao Paulo, Recife (Brasil); Buenos Aires (Argentina). October 2015. One-person show: “Luz Translation”, Centro Cultural El Nigromante Bellas Artes, San Miguel de Allende, Guanajuato. February 2 — April 23, 2017. One-person show: “Testigo Transeúnte”, Sala Nacho López, Fototeca Nacional, Pachuca, Hidalgo, Mexico. November 16, 2017 — January 21, 2018. Artist-in-Residence. Eyes on Main Street Photography Festival. Wilson, North Carolina, USA. December 2017. Work made of daily life and inhabitants of Wilson, exhibited during the festival from April to July 2018. Two-person exhibition: “Dos Miradas sobre Un Instante”, Galería Rubio, Mazatlán, Sinaloa, México. February 22 until April 7, 2018. Images that show two distinct visions of the Historic Center of Mexico City. Two-person exhibition: “Dos Miradas sobre Un Instante”, Alley Cat Bookstore/Gallery, San Francisco, California, USA. May 5 until June 2, 2018. Images that show two distinct visions of the Historic Center of Mexico City. Individual exposition: “Callegrafía”, Három Hét Galéria. As part of the Eleven Osz Fall Festival, Budapest, Hungary. September 2018. 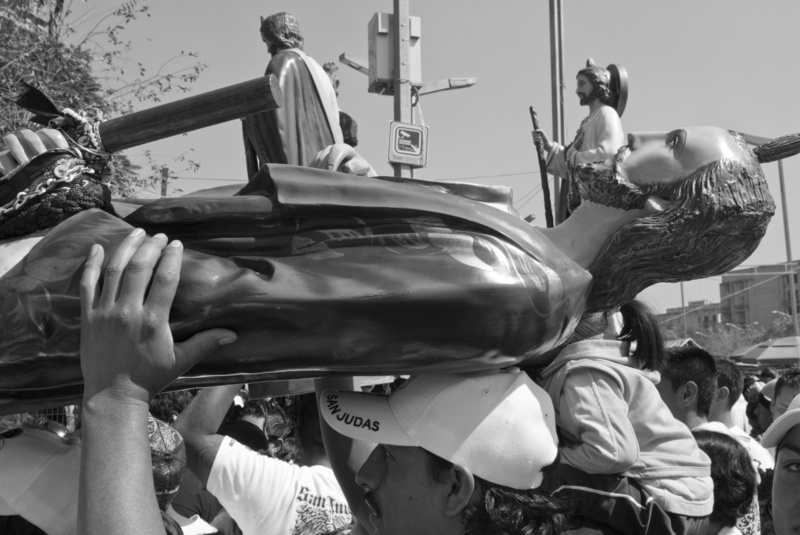 Get an insider’s view to one of the most cult-like festivals in Mexico City with a highly experienced photojournalist and resident authority on Mexican society.